The Naval Marine Archive ­ The Canadian Collection and the Canadian Society of Marine Artists are proud to present a Retrospective of the work of Hamish Berchem, CSMA. This exhibition will be held at The Victory gallery, 205 Main Street, Picton, Ontario. The opening is Friday, the 12th of April 2019 from 3-6pm. This special exhibition of watercolours and prints is a tribute to Hamish Berchem. It is an unique opportunity to view the span of his subjects and his love of the sea, ships and boats which he knew so well. Hamish was a sailor. 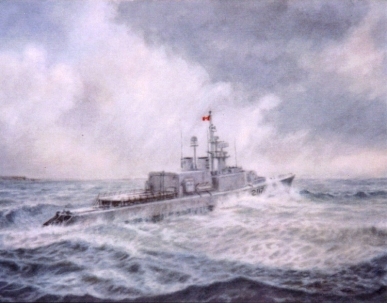 His background serving in the Royal Navy, Merchant Marine, the Royal Canadian Navy and the Canadian Government Research fleet is evident in his works. He portrays the sea state including the waters of the Arctic where he sailed. At times, in these northern waters, he retraced his father's routes aboard Nascopie. The history of the Royal Canadian Navy is very apparent in Hamish Berchem's works. 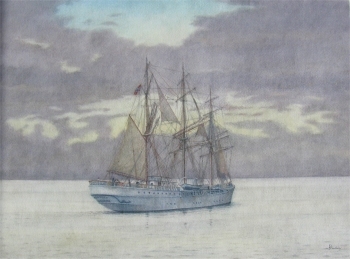 He worked with watercolours which allowed him to convey the mood of the marine scene. Hamish was elected to the Canadian Society of Marine Artists in June of 2010. The exhibition runs through to the 2nd of May. Many of the watercolour paintings and prints will be on sale.